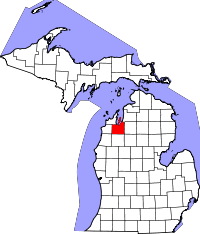 Grand Traverse County, which has a population of almost 90,000, has placed their entire death record index for free browsing and searching online at the County Clerk website. The death records are available from 1867, 15 years after the county was founded, to the present. Birth and marriage records are also available from 1856 to the present, and divorce records from 1857 to the present. The county's marriage record index is also available for online searching at no cost. Certified copies of all records are available for $10 for the first copy, and $4 for subsequent ones. The County Clerk, located on 400 Boardman Ave in Traverse City, MI., allows two individuals at a time in the genealogy research area. The office hours are on Mondays through Friday, 8:30AM till noon, and 2:00PM till 4:30PM. To inquire further regarding office availability or any other issues, the County Clerk can be emailed directly at gtcclerk@co.grand-traverse.mi.us.